So I’m finally getting around to writing up my son’s 4th birthday. 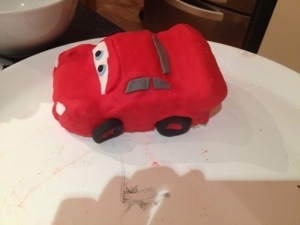 A couple of months ago I asked what he wanted for his birthday cake and he decided on Lightning McQueen from Disney’s Cars. 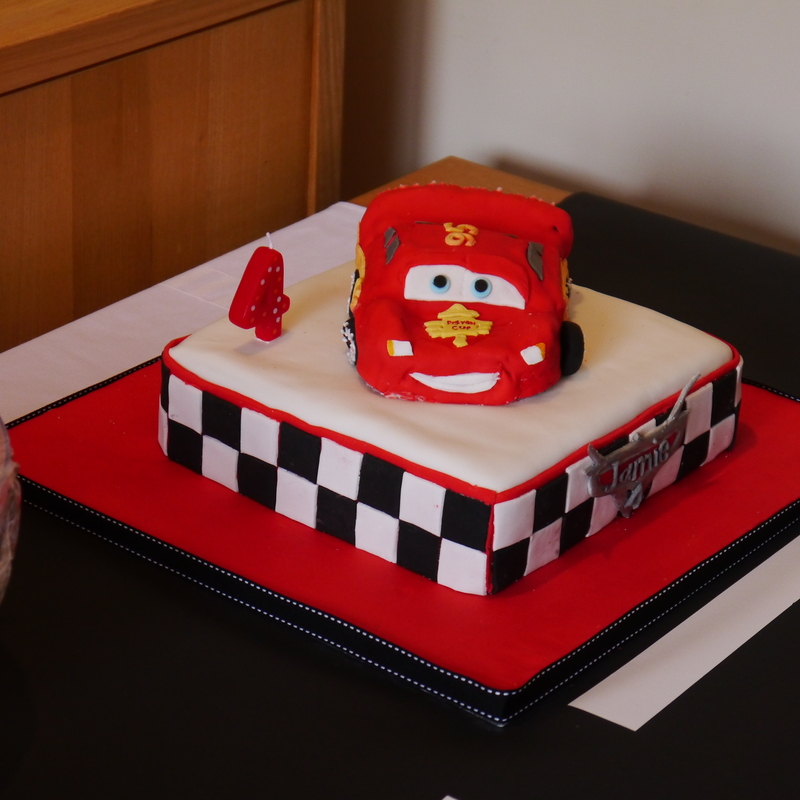 I had a look on Pintrest for ideas and decided on a two tier square cake with a carved Lightning Mcqueen as the 2nd tier. 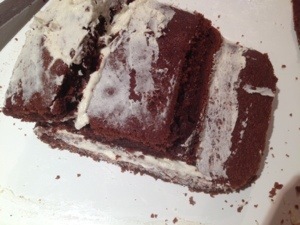 I used my standard Chocolate Cake Recipe and Vanilla frosting as a crumb coat for the cakes. The base layer was a 9 inch square cake and it took 3 layers to get the height I was after. 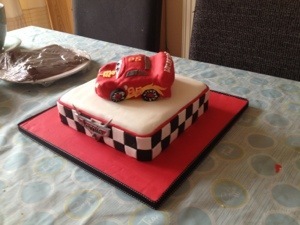 I originally baked 2 square cakes and a large rectangular cake to use for the car. 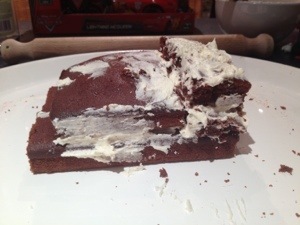 When I realised I needed 3 layers for the main cake I used most of the rectangular cake for this, meaning I didn’t have a lot of room for mistakes when I made the car from the leftover bits. 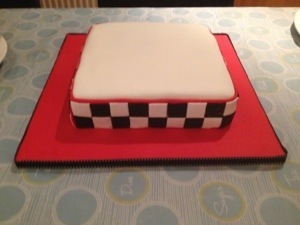 To cover the cake board I made up quite a lot of red fondant by kneading red gel colour though white fondant. 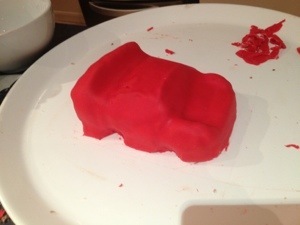 I made enough to also cover the sides of the square cake and the car. 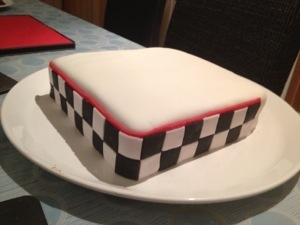 For the first tier of the cake I used roll out white fondant and then added a check effect to the sides. To make the checks I rolled out a strip of the red fondant the width of the side and then used White flower paste from Renshaw Baking and pre-coloured Black flower paste to make the squares. I used guidelines on my non-stick mat and a ruler to mark out the squares, cutting them with my mini pizza wheel sugarcraft tool . 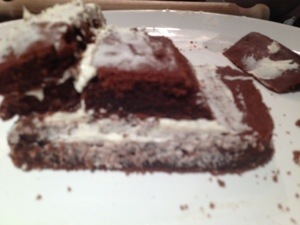 I then attached the squares to the red fondant using edible glue. 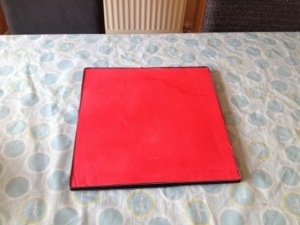 Once the stip was fully covered I flipped it over onto greaseproof paper and applied edible glue to the back before very carefully lining it up with the sides of the cake. I made two separate strips because I didn’t have enough space to made one long strip. Step one was to use vanilla frosting to join the basic layers together. Next I cut out the wheel arches and added bits either side of the hood where the headlights go. (Im sure it has a proper name but no idea what), before crumb coating with vanilla frosting and covering the whole thing in some of the red fondant I coloured earlier. I then started colouring flower paste to make the details. The wheels I made from solid black flowerpaste and made a dip in the middle which I covered in red to give the effect of alloys. I tried to make him look like he was doing the Cachow pose from the films but I’m not sure it shows. I made him into the version from Cars 2 when he has won the piston cup rather than the Rust-eze version. I used a cocktail stick to scratch out the words PISTON CUP and then went over them with the same cocktail stick dipped in red gel colour. To make the 95 numbers I half kneaded together some orange and yellow paste to make a graded effect before cutting out the numbers with a patchwork cutter. I then reshaped them slightly so they looked like the correct font. Finally I made up some thick water icing and piped World Grand Prix onto the bumper and Lightyear onto the tyres. To make sure the 2nd tier would be supported I cut some lollipop sticks to the height of the bottom tier and pushed them into it where the Lightning McQueen Cake board would sit. To finish the cake I used flower paste painted with metallic and red food paint to make a Cars Badge for the front of the bottom tier. 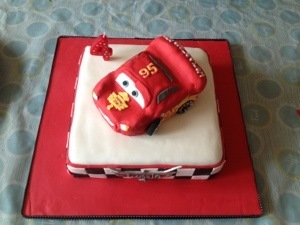 This entry was posted in Large cakes and tagged Birthday cake Disney Cake, Cars 2 cake, Cars cake, Lightning McQueen Cake, Tutorial. That looks absolutely amazing! My little one would adore that cake! Wow it looks great! You must have been so proud of yourself. How clever! A shame to eat it!